Ahem: Allow Me to Introduce Our Son: Little Thomas. 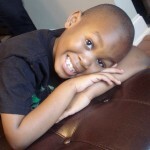 . .
I’m writing this 2 make you aware of the issue of Autism. This is very important to me for a variety of reasons, most importantly the fact that my youngest son is on the Autism Spectrum. Autism is a neurological disorder that affects one’s ability to socialize and assimilate into “normal” society. Right now the rate of children diagnosed with this disorder has skyrocketed to 1 in 100 children, and more alarmingly 1 in 70 male children are diagnosed with Autism. Older doctors tend to shun the diagnoses and will say things like, “oh, he’ll grow out of it” and things like that, but I urge all parents who sense something “not quite right” to seek help. If detected early, you can implement things that will help your child as he gets older, as opposed to ignoring it and then becoming angry or frustrated with the child. Most children on the spectrum often have unique gifts. 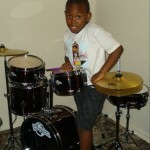 For example, my son is a natural drummer and plays scarily good without as much as having a single lesson. The key is to find a way to link with the child using his/her interests, as they will be few, and nurture those to the max. The hardest thing of all is being able to afford the schools that specialize in educating autistic children, as public schools are rarely equipped to do so. Sadly, it’s going to take some high ranking official with an autistic child to introduce legislation to help combat this problem, but until that day comes, its on us to do what we can for our children. Its important to make sure your child meets the “milestones” during the 1st 2 years of life and to have him/her checked if you notice that they have not. Its a fight for the long haul, so expect lots of disappointment in the system, but never take it out on the child, for their fight is a helluva lot harder than ours. 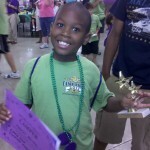 Visit www.AutismSpeaks.org | Get Educated. Get Involved. Improve a Child’s Life.